50150 is rated 4.6 out of 5 by 17. Rated 5 out of 5 by DoubleL from A nice option for reinvigorating shower Having a body spray to give you a gentle water massage in the shower is a great thing. The one looks great matched up with the rest of the Vero series, and works really well. Just had it installed, so can't comment on longevity. Rated 5 out of 5 by Miriam from Great product Love these body sprays. Very good quality, perform well and look very high end and sleek. Rated 5 out of 5 by Jeff from Bought a handful for a couple different renovation projects and these are both stylish and work great. Would easily buy again - likely black or one of the other colors when I decide to spend a bit more. Rated 5 out of 5 by MIke K in Palm Springs from Awesome pressure for this body wash!! 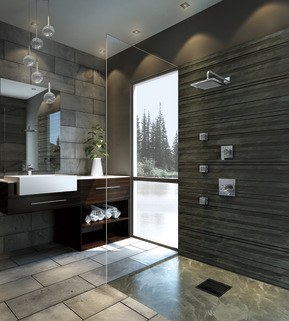 We bought this body wash as a set with the 6 function control valves, the Dryden shower head and the hand shower. Overall this is a fantastic set. The 6 function control allows you to turn on two features at at time. You can turn on the the main shower head along with the hand shower or the body washes or just the body washes and the hand shower. You can also turn on one item at a time. The main shower head and hand shower heads are plastic, which was a bit disappointing as it seems these should be metal, but the other parts are all metal. The hand shower hose is very good quality. 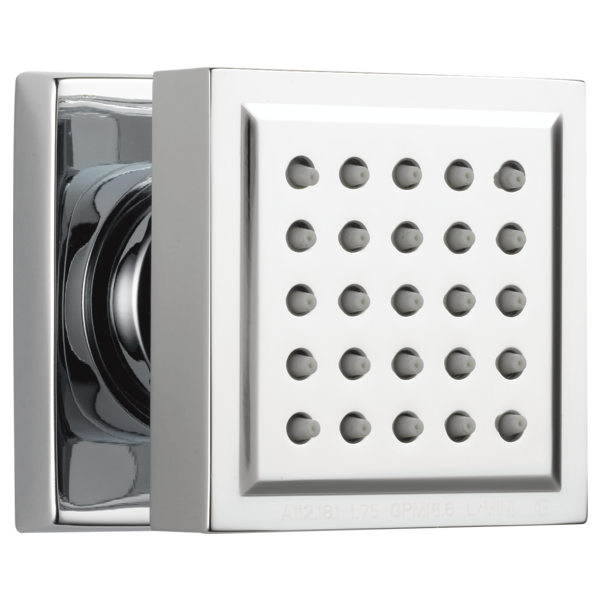 The main shower head seems to not have as good a pressure as I might like, it is more like a gentle shower head. The body washes are awesome, and are very high pressure. The hand shower is also more gentle. We got two body washes, and I would suggest getting three, it is worth the money to get the extra wash. (Might be a little less pressure with three, but use your best judgement if pressure vs. more volume is your preference. Installer says everything was easy to install and clearly labeled in separate boxes. Overall an A+. Hoping the plastic pieces hold up over time, but can always buy replacements if needed. I might like a more forceful (pressure wise) hand shower, but it still works well. We can always change that later. Rated 4 out of 5 by Brian from Great Looking These body sprays are a great addition to your standard shower and easy to install. Rated 5 out of 5 by Lisa from Love the Body Sprays We remodeled our master bath and put in two separate shower heads. I put the body sprays on my side and absolutely love them. My husband regrets not put them on his side. Rated 4 out of 5 by zayne from My wife and I love them I have had other products from the same line that I purchased for my last master bath remodel and decided to step it up a notch and add the body sprays. Glad I did, use them every day and love them. 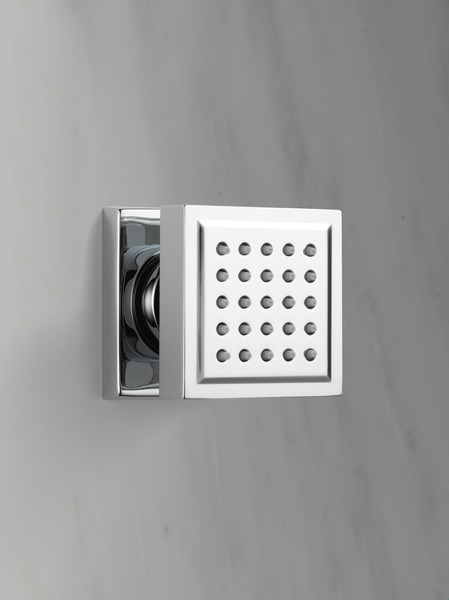 .75&quot; copper pipe to the shower head and body sprays or is it adequate to use .75&quot; supply to the valve and then use .5&quot; copper to the shower head and body sprays? The .75&quot; supply to the valve is pex pipe. I'm concerned that the .5&quot; copper from the valve might not allow enough gpm's when choosing to run the shower head and body sprays simultaneously. Thank you for your question. We believe that you have a good plan. Using 3/4&quot; pex lines is almost the same as using 1/2&quot; copper lines. The inside diameter is almost the same in both of those. 1/2&quot; copper is adequate for the valve inlet or outlet. We are doing a walk in shower without doors. 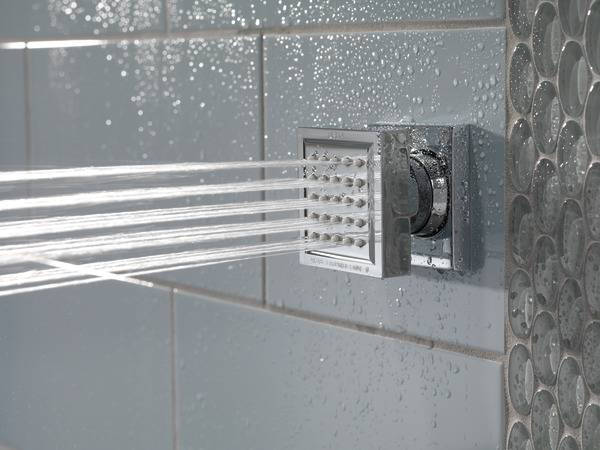 I have the overhead shower head figured out. 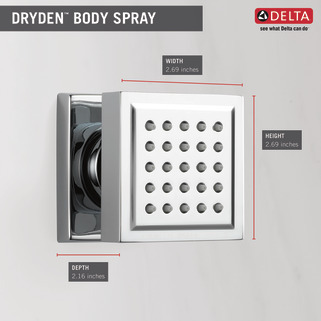 My question is about adding a Body Spray.Does Delta make Body Sprays that can be adjusted to spray towards the back wall of the shower away from the doorless front? 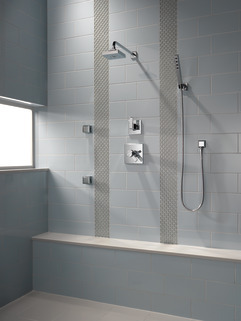 We remodeled our bathroom less than 3 months ago and went with 3 body sprays, a shower head and a rain shower head. So far we have been happy with everything except for how ugly the body sprays now appear. I have attached photos. I am assuming the water is causing the spots on the fixtures and the discoloration around the edges. Is there any solution to this besides wiping the water off them after every shower which is not practical. We love the body sprays and spent a lot of money on them and having them installed and are very disappointed about how they now look. Is the 30 degree adjustment only up and down? Or is it also adjustable from side to side. How to clean out hard water deposits clogging bottom spray?